We make cost savings on your long-distance calls easy. All you need to do is buy a VoIP phone that will not only bring you cost savings but also completely replace your existing fixed line phone. While there are many VoIP phone models on the market, we recommend the Gigaset C470 IP and Gigaset C595 IP models for use in the SIPNET network. These relatively cheap devices are similar to DECT phones in terms of ease of installation and use, but considerably better in terms of added features. 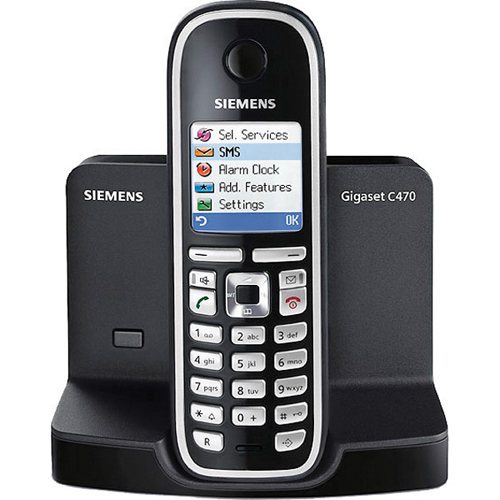 Gigaset C470 IP is a simple SIP phone combining the functions of traditional telephone and VoIP telephone. This telephone system supports Internet calls without a connection to a computer, up to 6 additional handsets and as many SIP accounts, and up to 3 parallel calls. Switching between traditional telephony and VoIP telephony with a press of a button. Simple VoIP configuration without a computer. Up to 3 parallel calls: two VoIP calls and one fixed line call from several handsets. ECO DECT – power conservation of up to 60% and adjustable radio signal intensity. Incoming email alerts showing the date and time of receipt and email subject. Messaging (contact list, chat, current status). Missed call notifications sent to a mobile phone. Advanced virus protection with a secure operating system. 128 x 128 dpi display (4,096 colours). Support of SMS messages up to 612 characters long. Phone book for 150 names and numbers. 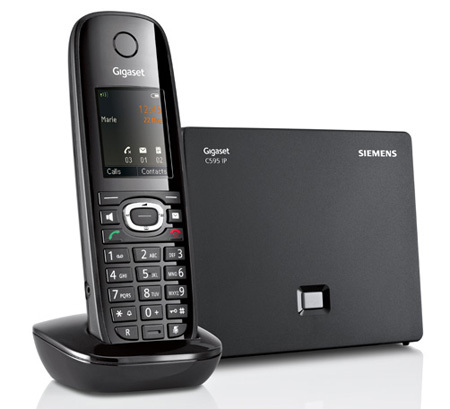 Gigaset C595 IP is a multifunctional SIP phone combining the functions of traditional telephony and VoIP telephony. Much like the simpler Gigaset C470 IP phone, Gigaset C595 IP supports up to 3 parallel calls but also offers additional function. For example, this phone system supports HDSP technology that ensures high-quality VoIP calls and has a built-in answering machine. An expandable telephone system with multi-line functionality for 6 handsets and support of up to six SIP accounts with different operators. Large 128 x 160 dpi display (65,000 colours). Advanced virus protection with to a secure operating system. Access to Twitter, Facebook, Ebay accounts.